Versatility Tool Works and Manufacturing’s robotic welding system utilizes the latest weld process techniques to deliver high quality, repeatable and esthetically clean welds. From conception to implementation, VTW specializes in all steps associated with welding processes. Our competencies include developing capable, and robust laser and resistance welding processes, tool and fixture design, process characterization, root cause analysis of weld defects, process validation and more! VTW designs and engineers all of our welding jigs and fixtures including those with hydraulic clamping features. 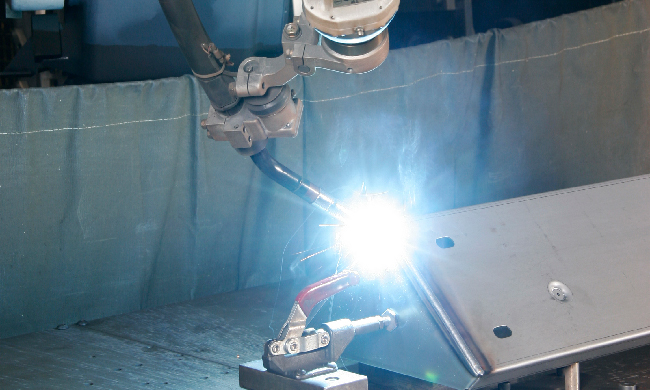 VTW’s robotic welding system produces consistent, high-quality welds with minimal surface distortion. Versatility Tool has successfully integrated robotic systems to significantly boost productivity and quality in our manufacturing process. Ultimately, Versatility's customers benefit through lower costs, shorter lead times, and improved quality. Storage systems can be gauged, while in the construction process, ensuring high quality, strength, and consistency.